Attacking Congress president Rahul Gandhi for hurling “galis” (abuses) at him and the entire backward community, Prime Minister Narendra Modi Wednesday called upon the voters in Maharashtra to punish those who are resorting to using of such a derogatory language. “Would you not punish people who are using such a langauge? Saja denge ya nahi… (Will you punish them or not ? ),” he asked even as the sea of saffron gave a resounding decision in his favour. Stating that when “chowkidar chor hai” bogey failed to find favour with people, Modi said the Congress dynast has started calling everyone with Modi name as a thief. “Naamdaar ne pehle chowkidaro ko chor kaha. Jab sab chowkidar ban kar maidan may aa gaye, jab har Hindustani apne ko chowkidar kehna laga… tab inke mooh ko taala lag gaya, mooh chhoopaker ghoom ne lage… chowkidar chor hai mamla chala nahi to ab wo kah rahe hain ki jiska bhi naam Modi hey woh sare chor hai (‘Naamdaar’ had initially termed chowkidar (watchman) as chor (thief). But when everyone came forward to say they too were chowkidars, he had to shut up. When ‘chowkidar chor hai’ slogan did not work out, they have now started saying that everyone with Modi as their name was a thief,” the Prime Minister said. Modi said he himself had become used to such abuses and can tolerate them, but warned the Congress and its allies not to humiliate backward communities, tribals, and Dalits as the country won’t tolerate it. “Arre mujhe gali do, mai bardasht kar loonga… agar kisi pichde samaj ko gali denge, to Modi bardasht nahi karenga, yeh desh bardashat nahi karenga (You can abuse me, but if you abuse the backward communities and Dalits, Modi will not tolerate it, this country will not tolerate it,” he said. Modi’s comments apparently came in response to a remark by Rahul Gandhi at a rally in Nanded last week where he threw a poser as to “why all thieves have Modi in their names” referring to Nirav Modi and Lalit Modi. Slamming the opposition parties in the country, Modi said they have no ideology nor any future road map but have a single point agenda of his removal from power. “The opposition has no ideology. They are not telling what they did for 50-55 years when they were in power. Neither are they revealing what they will do in the next five years. Whether in Bengal, Uttar Pradesh, Karnataka or Maharashtra, the Opposition has only one agenda, ‘Modi hatao‘ (Remove Modi). Everywhere they are raising the bogey of Modi hatao,” he said. 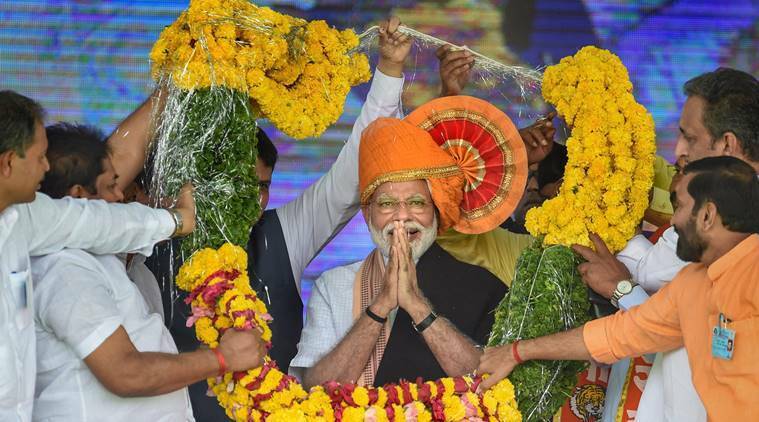 Modi said the life he was leading was inspired by families of greats like Bhagat Singh, Sukhdev, Rajguru, Chapekar brothers, Mahatma Phule, Babasaheb Ambedkar, Sardar Vallabh Patel, and Veer Savarkar. Modi said the massive turnout at his rally has made Pawar flee the poll turf. “Looking at this sea of saffron, now I understand why Pawar fled from the poll ring. Pawar is an outstanding player…He knows which way the wind is blowing. And that is why he took to his heels..,” the PM said. Modi said earlier government remained mute spectators to terror attacks. “But this government is different. Hum ghar may goos ker marte hain. (We chase down the terrorists to their hideouts). This is new policy of the new India. Aren’t you proud of our action in Pakistan after terrorists attacked our forces ? Didn’t you like this policy…,” he asked crowd amidst loud applause. He lamented that some political parties where questioning the sacrifices of the forces. “But this chowkdiar will not allow them to show our forces in poor light,” he said.